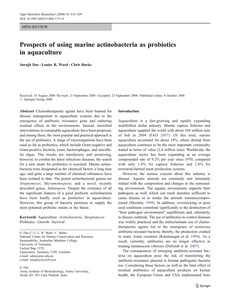 Chemotherapeutic agents have been banned for disease management in aquaculture systems due to the emergence of antibiotic resistance gene and enduring residual effects in the environments. Instead, microbial interventions in sustainable aquaculture have been proposed, and among them, the most popular and practical approach is the use of probiotics. A range of microorganisms have been used so far as probiotics, which include Gram-negative and Gram-positive bacteria, yeast, bacteriophages, and unicellular algae. The results are satisfactory and promising; however, to combat the latest infectious diseases, the search for a new strain for probiotics is essential. Marine actinobacteria were designated as the chemical factory a long time ago, and quite a large number of chemical substances have been isolated to date. The potent actinobacterial genera are Streptomyces; Micromonospora; and a novel, recently described genus, Salinispora. Despite the existence of all the significant features of a good probiont, actinobacteria have been hardly used as probiotics in aquaculture. However, this group of bacteria promises to supply the most potential probiotic strains in the future.